Sometime in March my friend M in California contacted me about making a flower. She always seems to be throwing her friends showers or parties. And she always comes up with the coolest themes, and unique decorations and amazing food. She ordered a custom flower for a baby shower. She requested a flower in blues and greys because the shower theme was showers. I used 4 shades of blue and one transparent grey. 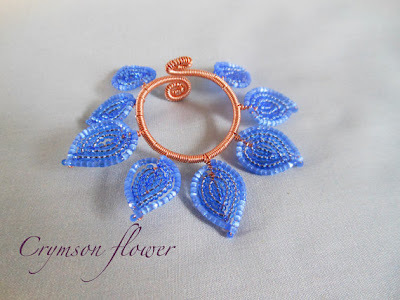 The blues range from satin blue to tiny silverlined size 15 sky blue seed beads. The center is a glass crystal from a vintage necklace. 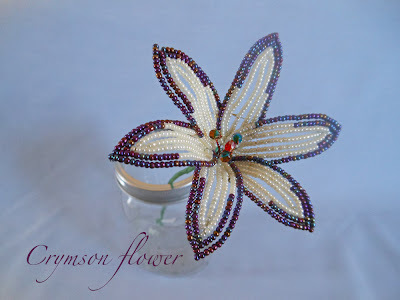 This is a great example of how to use one of my beaded flowers in a special event. When the food is all eaten up and the umbrellas put away. After the fresh flowers fade and wilt she'll have the beaded flower as a memory of her shower, her friends, and her little one. This week's sneak peeks are simple and to the point. I have a pile of petals that I'll be putting together this weekend. Hopefully I'll have some finished flowers to photograph by midweek and new flowers to show off by the end of next week. Last Saturday I was on a roll. Finished up a couple of projects then cranked out two flowers worth of petals. Hopefully tomorrow I'll find the same flow and finish some of these up. Do you like the colors? I've been in a bright color mode lately. Well we did have snow last week so I guess it also literally feels like Christmas here. But today the weather is warmer and the sun is out. It feels like a break for now. 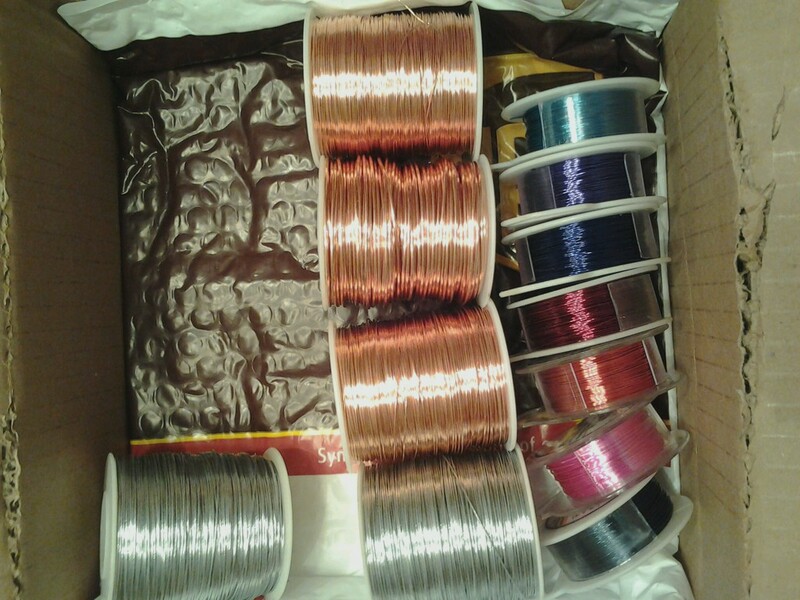 But the more exciting news is that my new box of wire that I ordered came yesterday. This is what 7 pounds of wire looks like. Honestly I would have thought it would have looked like more. Nevertheless I'm still super excited to get this shipment in. One because it's always fun to receive a package in the mail. 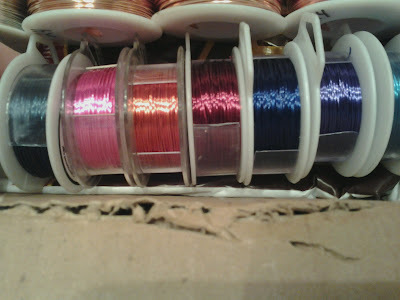 And two because I've finally found a supplier of wire in one stop shop. It's an exciting relief and I'm going through a lot of wire these days. I have no idea how long this will last me. Suppose I'll find out soon enough. So, what do we have here? 7 rolls of different colors of copper coated wire. I'm just beginning to start to play with colored wires. A few months back I ordered a sample roll of purple and silver and you've seen it in my wine charms here and here. 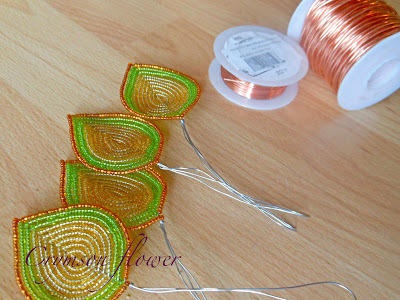 I want to expand on the roll copper wire plays in my stuff. I really love the natural color of copper, but that's not everyone's thing. And sometimes the copper elements need the bit of color...this can offer that. 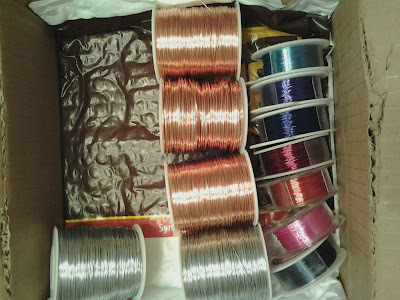 I also bought some copper and steel wire. I love having a stash. It makes me sad when I'm out or my stash is dwindling. So looking at these guys now makes me very happy. The good and exciting news that I've received over the last couple days is that I've been juried into and accepted invitations into all the shows I've applied for so far this year. EEK! I'm excited. Super excited. I have lots of things I need to do. I even have yet to start the list of things I need to do. I think I'm sort of stunned or shocked I guess because panic and urgency has not hit me yet. Hopefully it will soon because the first show is a mere 5 weeks away. Expect lots of preparations posts in the next few weeks. It'll be an exciting journey to share. I was so excited to start this project. The idea came after an afternoon hanging out with my brother. Remember back in the day when I made my strawberry plant? I really love that project. Well he suggested I revisit projects like that. Strawberry plant is one of my favorite projects I've made. The strawberries are made from Swarovski crystals in many shades of red and pink. There's a piece of me in that project. But he started the spark that would become the idea for a strawberry wreath. Instead of only using crystals for the berries, I combined crystals, three cut, and round seed beads in various shades of red. I used tiny size 15 black beads for the seeds. The flowers are a fun simple little flower made from super tiny size 15s and they also have a cut to them. If this wreath is displayed in the sun or even in high light it will certainly sparkle. But it's a subtle sparkle. It's a taste of summer. A season that is still eluding us right now. I'm not even sure if we'll have a strawberry season this year. If not at least you can hang one up on your front door. Purchase information can be found here. A very important lesson was learned while making this wreath. Small focal points mean more focal points, more leaves, and more arranging. This also mean it takes longer to complete. So this wreath has a slightly higher price point. It is definitely worth the little extra everything though. Friday's I like to save for a sneak peak in what to expect in Crymson Flower next week. This week took a little turn in my creating plans when I received a custom order. I had major flower plans, a new wreath that was started last weekend and some single flowers have been started. 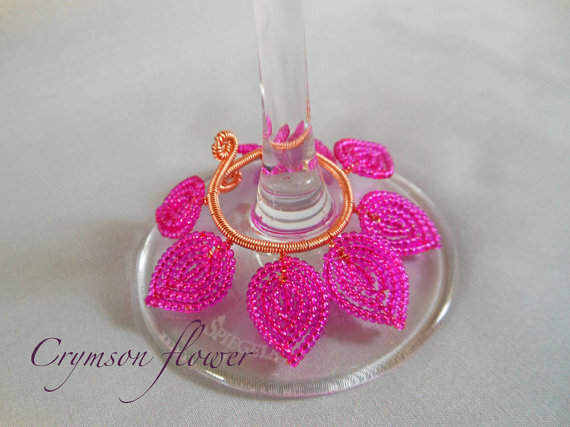 A custom order for 21 wine charms kick started my need to make some headpins. It's been years since I've played with a torch. I've been meaning to make headpins for months but kept putting off setting up the torch equipment. It's really not that big of a deal to set up it's more of a well I can set up and make headpins or I can sit down and bead a flower. Flowers tend to win. Since I had everything set up I made a ton of pins. Little red balls on copper wire. They're so cute and fun. I managed to burn myself once, touching a copper ball when it was still much too hot. Occupational hazard I suppose. I'd forgotten how fun it is to melt copper. It took me a little bit to get back into the hang of it. But once I found a groove it was simple. I also cut out some simple shapes from some sheet copper I found in the box. I put each of the pieces through the flame a few times to get some heat color on it. I'm not really sure what I'll do with those, but I have some preliminary ideas I want to explore. This weekend was a big weekend. I cranked out the exciting beginnings of a new wreath on Friday night. Saturday we went to my brother's and SIL's house for a turkey fry. Then Sunday morning me, C, R, Mom, and Dad took a hike in my back yard. We back up into an unofficial nature preserve. It's where all the strange critters that visit my house live. It's also very wet and wooded. Back in the day Mom used to make baskets. She would go hunting for natural plants and trees to use in her baskets. Mostly grapevine, dogwood, and willow. She came up with the marvelous idea of me trying to make my own wreaths for my flowers instead of buying them. So we went on a little adventure. Mostly we found lots of grapevine. The wreaths I buy are made of grapevine, but a very different kind. 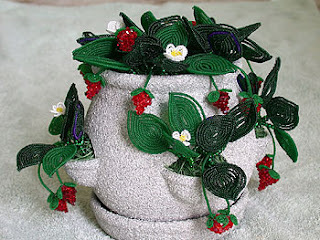 The store bought ones have very small twigs and tendrils and are not really woven together. The wreaths we made with the grapevine we found were thick, and heavy. Mom taught me how to twine them, I wasn't very good at getting them nice and tight. She did a much better job. We also found some grey dogwood, red dogwood, and willow. Dad was able to identify them for us so hopefully I can remember where and what each looks like. He also showed me how to ID poison ivy when it's in vine form. Don't want to mistake that for grapevine! The red dogwood and willow were the most flexible, but that really didn't make them the easiest to work with. I still managed to snap the few good branches we got. Here's me attempting to twine some grapevine. The grapevine is interesting. There's really no taming it and getting perfect circles. You never really know what shape or texture you will get from a piece. This is kind of exciting. We just made round wreaths but the idea of maybe a tear drop wreath or even just an abstract shape could be fun. We didn't find much dog wood and willow so we were only able to get one wreath out of it. 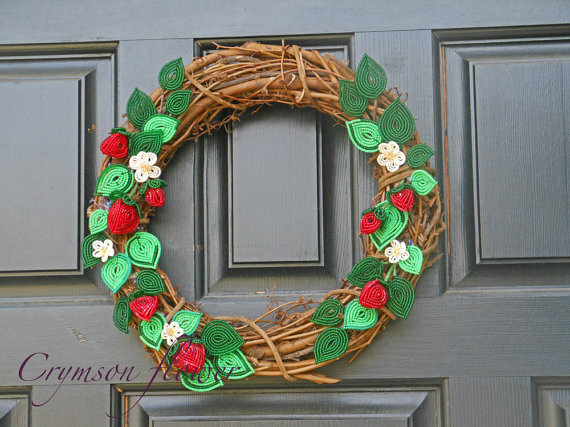 Below you can see a smaller wreath toward the right with a touch of red and green in it. The red is the dogwood and the green is the willow. 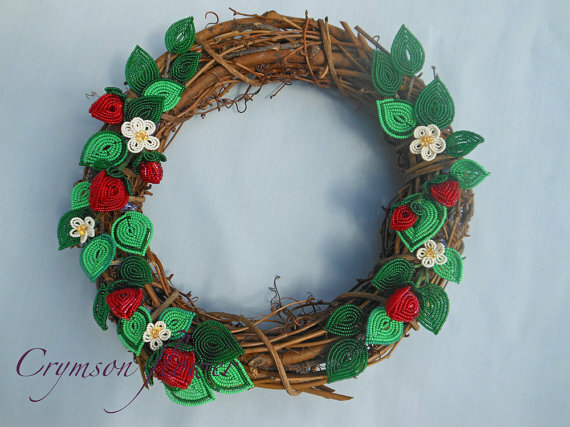 I wish I had more dogwood, red wreaths really appeal to me. Plus the bark is smooth which I like as well. 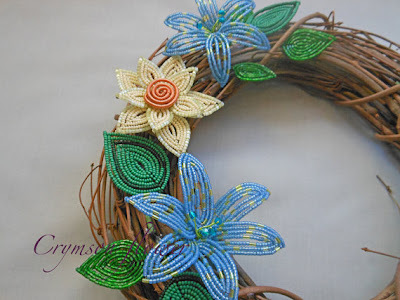 These handmade wreaths are a lot more rustic than the store bought ones. The wreath on the far right (above my foot) is a store bought wreath. It's lighter weight, probably dyed so that its a darker brown, and it's mostly perfectly round. Fresh grapevine is heavy, gnarly, and the bark is very loose and looks messy. 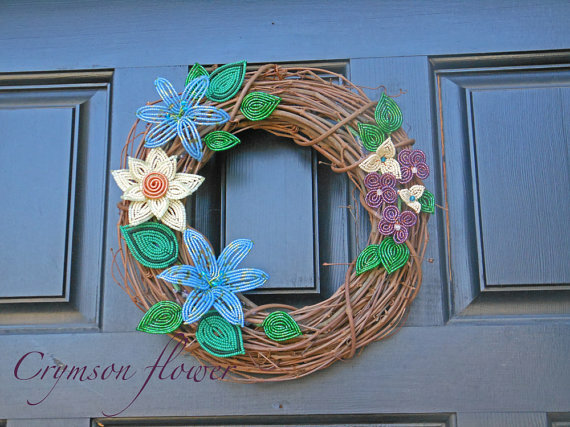 I want to spend some time with these wreaths, maybe picking away some of the loose bark and laying flowers on them. I think there is definite potential here. I just need time to refine the process. Here are some quick pics of what I was talking about earlier this week. 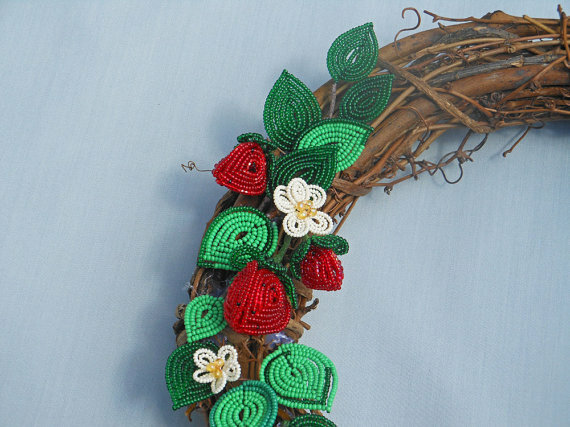 First we have the strawberry wreath, which right now I'm in a love/hate relationship with. I love it I really do. But it requires a lot of leaves. WAY more leaves than my other wreath. Leaves are time consuming and tedious. From my last post I added about six light green leaves and I'm pretty sure it needs at least six more before I can be really happy with it. It will be amazing when it's done. 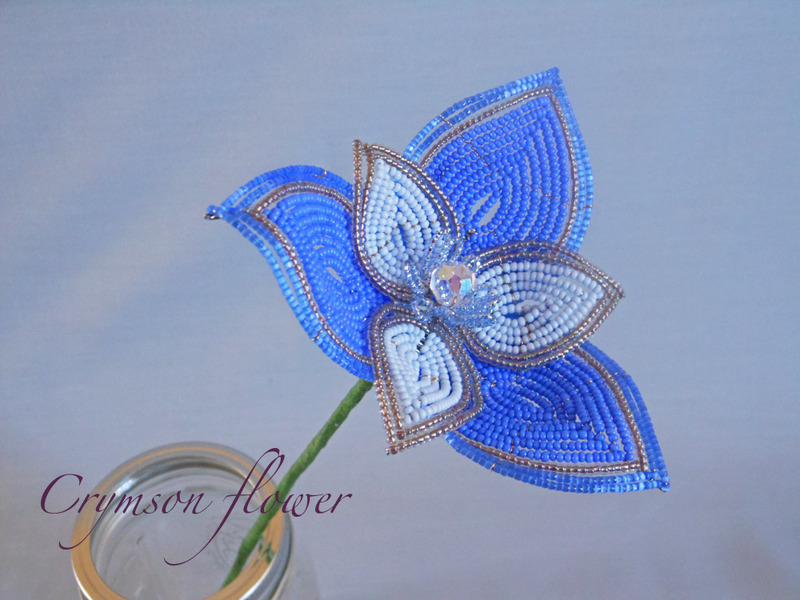 Next is a single flower that I'm playing around with. Right now the colors aren't quite right but you can see I have my wire out and I'm going to see what I can do to save it. If this idea doesn't work out I may end up in a scraps pile b/c I have a lovely color combo for a blue flower in my head right now. I hope everyone has a good weekend. It's cold here again and it rained all week. I think it's supposed to rain most of next week too. I'll do my best to provide flowers to warm us up. I first learned about what value is when I started a quilting a couple years ago. 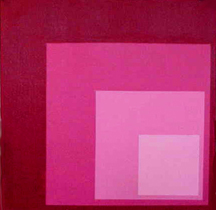 My mom's a painter and she's tried to explain to me the importance of value, both in my quilts and in her paintings. Mostly I understood what she was saying but couldn't really implement the concept myself. I will see it when I have a quilt that looks amazing, and then my next one is very eh. I step back and think what went wrong. That's when someone points out that I've used all the same value and thus lost some of the pop and interest. That's when I can see it. So when I try and plan ahead to use different values I get hung up and my mind starts weaving knots. It disrupts my creative mojo and somehow I end up making something else all in the opposite value. I stopped reading beading tips, suggestions, and how to's years ago. So maybe there is more material out now but I've not ever read anything about value with beads. But since they are color and come in different shades and lightness I'm thinking all the same rules apply. You want different values in a piece. And apparently if you can create an interesting pattern with the value (which can be the same color) you'll have a masterpiece. Here are some rules of thumb about value that I found on write design online. I haven't gotten far enough into my color theory education or even experimentation to attempt to photograph the pictures of loose beads and finished flowers to try and figure this all out. And better yet explain it. 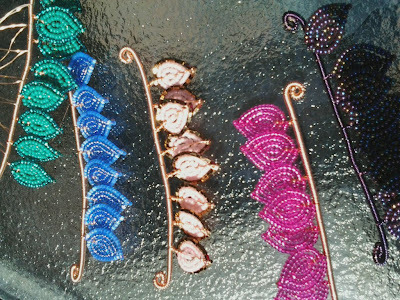 It would be giant undertaking considering not only do beads have lots of colors, shades, and brightnesses, but each one can have a different finish. Such as silverlined beads, a pearl finish, A/B finish, this all adds dimension and changes the value. 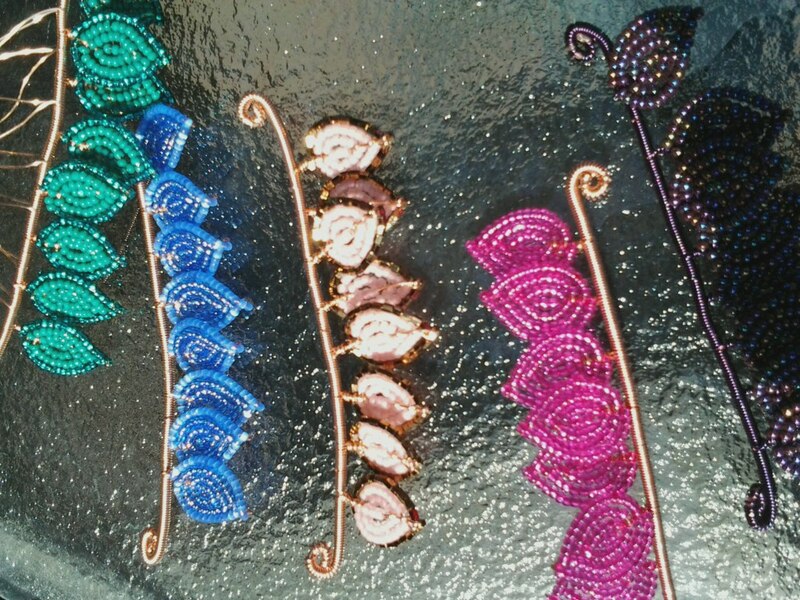 Even the type of wire or thread used will change the color. All these thoughts popped into my head after I showed Mom my semi finished strawberry wreath. I was kinda eh on it...which felt weird because I've been excited about it for weeks. She pointed out that the red strawberries were probably the same value as the grapevine branches. Which makes them not the first things you see. But they are the main deal so I'm in fix it mode. Fix it mode turned into think on it mode. 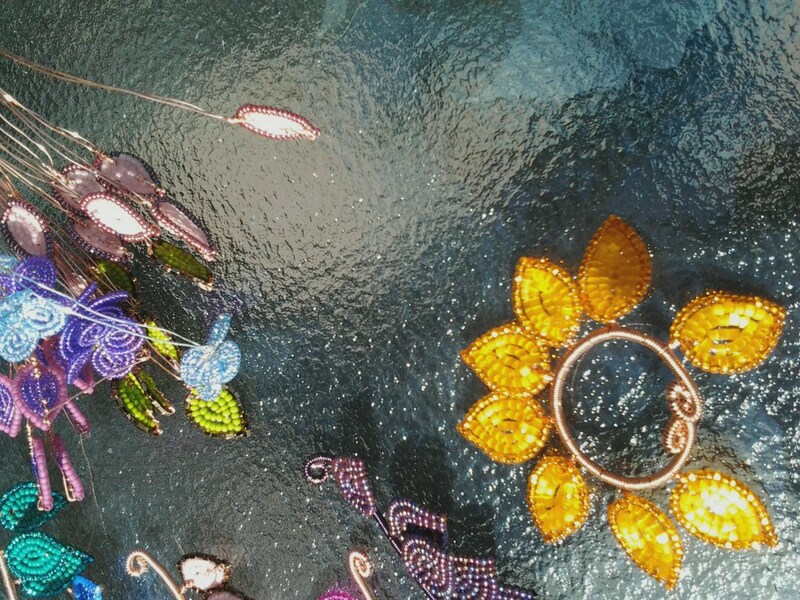 So I picked up beads and started a new flower which now that I'm looking at it, it is also all the same value. So I came here to try and figure out my love/hate relationship with value. Then maybe back down to my table to try some different thoughts. Does anyone else have struggles with value? does it take a degree to finally understand it? Or is it just one of those things that's worth the struggle? oh my gosh...it's the first warm days of spring. I'm so excited that it's warm outside. Usually we have warm days in March, and occasionally in Feb. This year is already another wacky weather year. So what's been going on during this lovely weather? We have the outdoor work bug. Last fall we cut down some pear trees that attracted so many bees it made the spring and fall almost impossible to be outside without being stung. So with those gone we were missing our trees. This weekend we bought an October Glory Maple tree for our yard and planted it with lots of love. R found as many worms as he could and put them in the dirt by the tree to help it grow. I also sent off my applications for two local art shows. I've already heard back from the Mackinaw Valley Vineyard, where I'll be selling my flowers and wine charms on July 21. The other is at our local botanic gardens and that is a juried show. Not sure when I'll find out about that....but I'll let you know. Then today I received the application information for an art Fridays event which is also local. Every 4th Friday from May to August there is an Art on the Boardwalk event. It's a small boardwalk area next to some lovely local shops. It draws quite a crowd and I actually think I'd do really well here. So I plan to apply for all 4 Fridays! It's a juried show, so if I get in I'll be super busy. And that means my first show would be in less than two months. ACK! I'm super excited, and the creative fire is glowing. Tonight I set up my little table and get to work. My to-do list is pages long, but first I need to make stuff. I'm thinking more wreaths for sure. Any other suggestions? I know I need more of everything but what's your favorite thing to see? For this week I have new wine charms in the shop. I had a blast with colors this time around. I went bright and fun and summery. We're starting with bright pink then onto an amazing blue. The blue one has those satin beads that make glass look like, well satin. It's too delicious to get the full affect in a photograph. I haven't talked much about my studio. I plan to. I have a traveling studio, one I unpack where ever I set up shop and start working. Below is a pick of what today's studio looks like. Today is the warmest day of the year so far. It's so excellent out that I couldn't let the day go by with out being outside in it. So I set up a temporary studio on the deck during R's nap. Forgive the less than fabulous photos, they were taken with my non-smart phone. You get the point though...lots of beads, wine, a lone beer bottle for wire scraps, and all in the sun. Next week you should expect wine charms at some point. I'm a little behind since the wreath takes longer to make my working ahead schedule was thrown off. 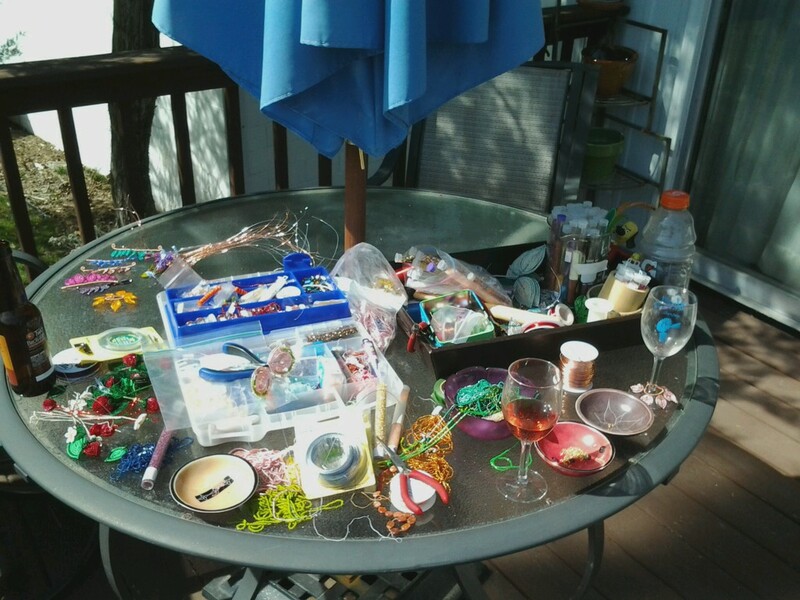 But I have some wine charms in the making shown above and below. Now I just need to take some pictures for posting. Below is a sneak peak at what will be the next wreath. Can you tell what it is? I'm so super excited about it I had to show a sneak peak but not sure I'll share anything else. I made some extra for some wine bottle pendants. Have a good weekend. Enjoy the sun and the tiny bits of green starting to peak through. Back in 2009 I made myself a french beaded flower wreath and I love it. I hang it on our front door every spring and summer and when fall hits I bring it in and it hangs in our guest bedroom. It's fun to have something unique and welcoming on my front door. About a month ago I got the urge to make another wreath. I've been thinking about broadening my price range in Crymson Flower. Right now everything in there is on the low side of the price scale. Bouquet of beaded flowers are the obvious way to increase the selection but when I had the urge for another wreath I was very excited. It took me a couple weeks to get up the nerve to try a bigger project. Then one day I sat down and just made a lily, then a star flower (the cream w/ copper center), and then some leaves to accent. 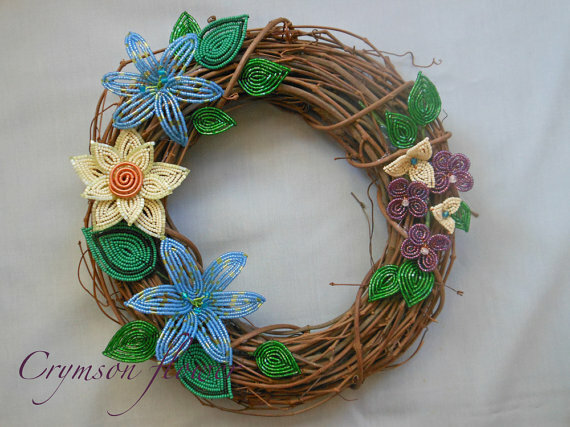 In hours I had the beginnings of this wreath. I really enjoyed adding the greens even though that is typically what I dread most making. The pop of sparkly green looks amazing next to the natural grape vine. 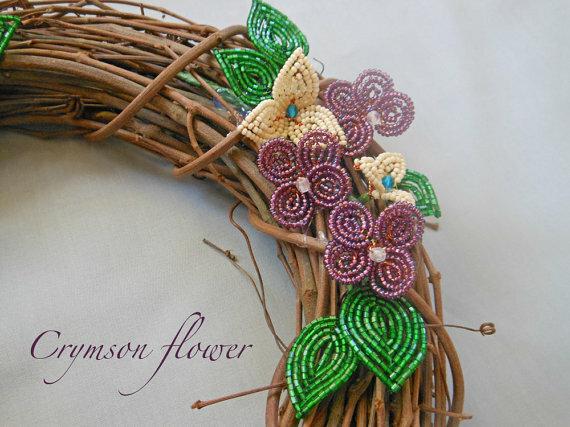 I love using the rustic copper and grape vine with the bright sparkly beads in the flowers. I think the contrast is stunning. The wreaths take a bit longer to make, so they might be slow coming. 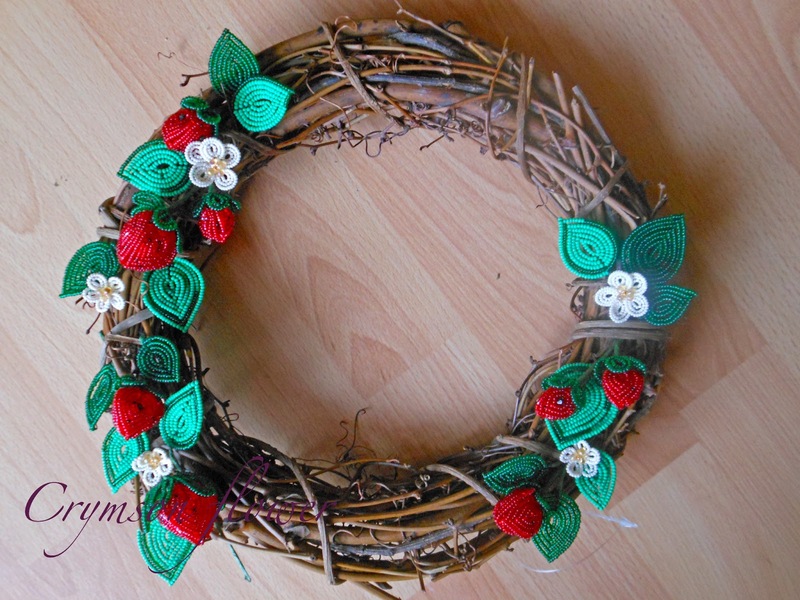 I have tons of ideas and the second wreath already half completed. Next week Mom is coming to visit and we are going to go on an adventure to see if we can find any willow or dog wood so that I could maybe make my own wreaths. 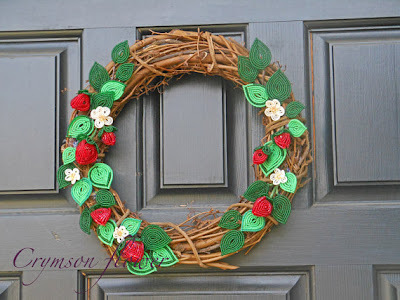 Using different woods will let me give different textures and feeling to the actual wreath. More on that adventure in a couple weeks...if we find what we need. So I've been over my head in behind the scenes business decisions the last two weeks. I have a to do list and deadlines that are fast approaching which forced me to sit down and get stressed out. I figure I'll share some of that thought process, as cyclical as it is, with you. I plan to apply to sell in art shows this summer. I have two local shows that I have applications ready to be sent in, and was thinking about doing a show up in the Chicago area. The show up north is near home and I've seen the kinds of crowds it draws. It's an extremely intimidating show to think about but I've always thought that it is a place that I'd do well at. I still do. It would be an excellent opportunity to force myself to really work and get up to speed by August. The other two local shows are in June and July so by the August I would have my booth down. Unfortunately this show requires by business license number in the application. I plan to get this license and have only been going slowly on it because on it I need to decide if I want to file for a "Doing Business As" certificate. The DBA is would allow me to open a checking account as Crymson Flower instead of just my legal name. A DBA takes 3-4 weeks to get. This was a harder decision for me to make than I was anticipating. I love the idea of having Crymson Flower be me, even though for practical reasons I probably don't really need it. It would really only be valuable if someone were to write a check to Crymson Flower I could then cash that check. But in reality if someone is writing me a check I would be there to tell them to write it out to me. I also have a stronger Internet presence as Crymson verses my legal name, Amy McGovern. This stems from my natural tendencies to try to be kinda anonymous on the Internet. But now that I am a business owner I think I need to have my name associated with my business. I'm proud that I'm working on this business. It's been a dream for a really long time and I want people to know that Amy McGovern is the person behind Crymson Flower. That there is in fact a person behind this business. That is also important to me. So right now my decision is this. I'm going to go by Amy McGovern as my business name legally for the paperwork. I'll still use Crymson Flower as my banner and my Internet presence as I always have but I plan to also have my name more prominently visible. My banner above now has Amy McGovern on it. If next year I'm missing or feel the need to use Crymson Flower on the paperwork then I can add it on then. I've also made the decision to wait on this particular Chicago area art fair. I sill think I'll do well at this one but I think it's adding too much stress on my already large to do list. I felt better when I admitted that to myself this morning. I am looking for a Christmas show in the Chicago area to sell at. That would give me more time and I'd be able to set up a Christmas tree full of flowers and beaded ornaments. It would be amazing! That is my business plan as of right now. Today I feel good about it. Now onto more flowery goodnesses. Here's my newest lily. Off white petals tipped with dark purple seed beads. The center is a small pop of red and blue faceted glass beads. I wasn't sure about this flower. 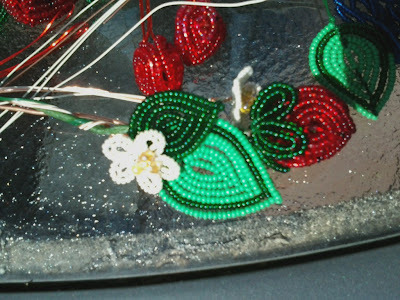 When I put the beads together I thought it would be an ok flower, but when the petals came together I got very excited. 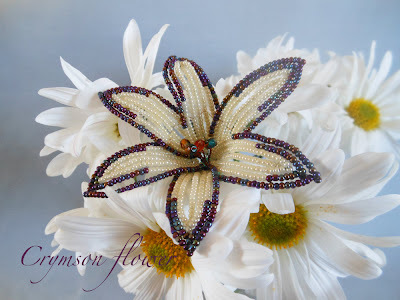 I think this one looks best paired with other flowers both beaded and fresh.